Fathers and sons have a special bond. Sons look up to their fathers and often see them as the prime example of the men they want to become. The Bible has many good and not-so-good examples of Father-Son relationships. 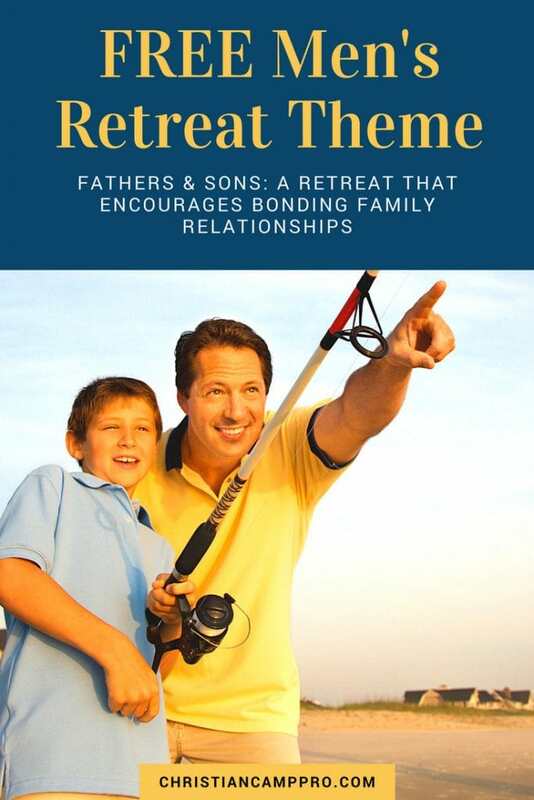 This Fathers and Sons retreat will look at what scripture has to say about this special relationship and teach men ways to be godly examples for their sons to follow. When a father lives a life that is honest and good, his son will take notice. He may not always successfully follow his father’s example, but he will never forget that his father lived a life of integrity. Use the verse to remind fathers that it’s important for them to demonstrate godliness and integrity in front of their young children. It’s important for fathers to remember that love and patience go a lot further than anger and annoyance. Children should be instructed in love and not driven to exasperation. Use the scripture to show fathers the importance of controlling their tempers when dealing with young, often rambunctious sons. Making good choices is not always easy, especially for young children. Fathers should encourage their sons to make good decisions and praise them when they choose right over wrong. Use the scripture passage to instruct fathers to not only teach their children right from wrong, but to praise and acknowledge the child when he makes wise choices. This simple craft is easy for fathers and sons to do together. Simply supply nails, craft wire and cord and allow guests to follow the instructions to make these cool cross necklaces. Inexpensive materials and easy assembly make this a great craft to whip up on the fly. Fathers and sons can put together and customize their paratroopers and even compete to see who can do the best “jump.” All you need are cheap pipe cleaners and coffee filters. This is a great craft for fathers and sons to make together. Give each father-son team a shoe box, wooden dowel rods and wooden clothespins to make this super fun foosball game. They can customize it any way they wish and take it home to play together for hours of father-son fun! Set up an obstacle course or relay race for fathers and sons to run together. Vary the degree of difficulty based on the ages and ability of those in attendance. This can be done indoors or out depending on your space. The father-son team to finish first or successfully complete the course in the best time wins. Equipment needed: course cones, flags, divider tape, etc. Instruct fathers to bring pictures of themselves as teens or children. Place all the pictures on a wall and let guests guess which picture goes with which father. Sons will get a kick out of seeing pictures of dad as a kid! A full guide to this baby picture game. Get your father-son teams up and out-of-doors with a fun scavenger hunt. Customize your list to your surroundings, but make it challenging enough to be fun. Set a time limit and send your teams off to work together to find each item on the list. Consider making your retreat a one-night campout. Set up tents, build a campfire, roast marshmallows and enjoy some father-son bonding out in nature. The bond between fathers and sons is special and important. Fathers teach their sons how to become men and sons remind dads of the importance of childlike faith and love. A father and son retreat can be a great time for dads and their children to learn about each other and celebrate one another. Looking for a Mothers and Daughters Retreat? We have that too! Special thanks to North Street Mission for making this article possible.